Standing in one place among countless other spots on the planet, most of which we'll never see firsthand, it can be hard to grasp the totality of the geologic and meteorological forces behind the natural disasters that shape our planet and our lives. But the view from space can help put that awesome power in perspective. International Space Station astronauts were taken aback when they looked down into the eye of supertyphoon Maysak in early April, 2015. The center of the huge storm was 19 miles wide. "By far the widest one I've seen," tweeted astronaut Terry Virts. This image captured by the crew of the International Space Station on October 9, 2014, shows the full scope of supertyphoon Vongfong, with the curve of the Earth as a backdrop. Winds swirl the smoke from multiple wildfires in Siberia in 2012. Over 17,000 wildfires burned more than 74 million acres that summer as NASA's Aqua satellite observed and captured images like this one. NASA's Aqua satellite captured this shot of a supercell thunderstorm that spawned a tornado that devastated the town of Moore, Oklahoma, on May 20, 2013. The red line shows the 20-mile destructive path of the twister. This LandSat 5 image captures the path of damage left by a tornado as it tracked across the ground from Springfield to Sturbridge, Massachusetts, on June 1, 2011. In May, the largest mountain in the Galapagos Islands, Wolf Volcano, erupted for the first time in three decades, sending a stream of lava into the Pacific Ocean. NASA's Earth Observatory captured the geologic tumult. At least two levees on the flooded Mississippi River burst on June 18, 2008, leaving much of Gulfport, Illinois, under water. 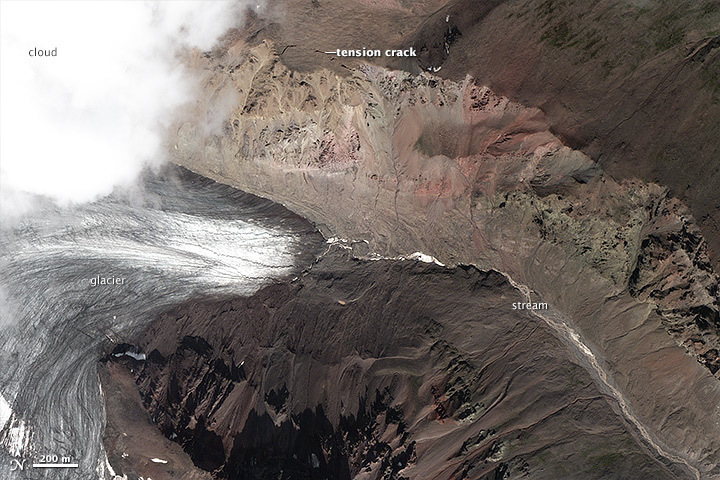 A Pleiades satellite managed by France’s Centre National d’Etudes Spatiales (CNES) captured this shot of the aftermath of a landslide in Alaska's Wrangell-St. Elias National Park on August 13, 2013. The debris covered a small finger of the Nabesna Glacier. The extent of the impact becomes more clear when compared with an earlier picture of the same spot, preslide. 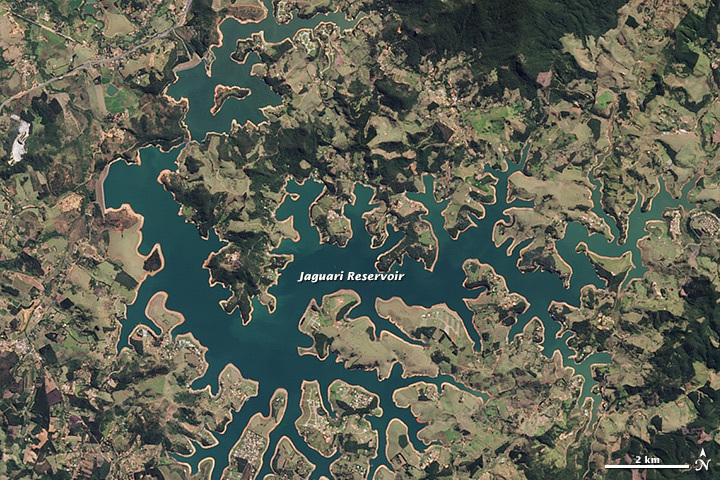 The ravages of drought are apparent in this Landsat 8 image of Brazil's Jaguari Reservoir taken in August of 2014. The brown ring around the water shows its recession from what it looked like just a year earlier. Lightning outshines the night lights of Kuwait City and nearby Saudi Arabia in this shot taken from the International Space Station. While humanity's footprint is most evident from space at night, every now and then a storm can intermittently remind us that natural forces likely remain the most powerful.